SO lucky to have home delivery!!!! There used to be a company in KC that did home deliveries, but has since closed their doors. decant – Funny they would call it this! And consumer all the watercress within 1 day of opening? WOW! Home delivery is pretty widespread here – 25% of households don’t have a car, so there’s a definite need. In addition to I think the half dozen or so major supermarkets, our greengrocer, butcher, and favorite restaurant deliver, too. Useful! Philadelphia Cream Cheese: “To enjoy this product at its best consume within 1 week of opening” – Nope, I’ve had it last a good month before. Ketchup: “Once opened, keep refrigerated and consume within 6 weeks and by date shown.” – I love ketchup, so I doubt a bottle’s ever lasted that long in our house, but it seems rather short to me. Maraschino cherries: “Refrigerate after opening and use within 2 weeks.” – Those have been in the fride since last year sometime. I just checked; they’re still fine. 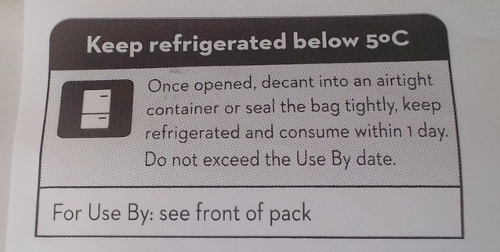 Jalapeno slices: “Refrigerate after opening and use within 14 days” – Nope, these last months. Wholegrain and Dijon mustards: “Once opened, keep refrigerated and consume within 6 weeks and by date shown.” – Nope, mustard lasts forever. Cheddar cheese: “Once opened best consumed within 3 days.” – Nope, this lasts weeks. Flour tortillas: “Once opened, reseal, refrigerate and use within 3 days. Suitable for home freezing: freeze immediately and use within 3 months.” – No, you shouldn’t refrigerate tortillas, just like you shouldn’t refrigerate bread. Besides, tortillas will be fine for a week or more. No, guys, really: if it’s frozen, it’s not going to spoil. The quality might suffer a bit, possibly, but I’ve never found that to happen yet, myself, only read about it. Even if it does, it’s just less tasty; it’s not actually going to hurt you. Ugh. I really detest the brainlessness and massive waste these labels give rise to.